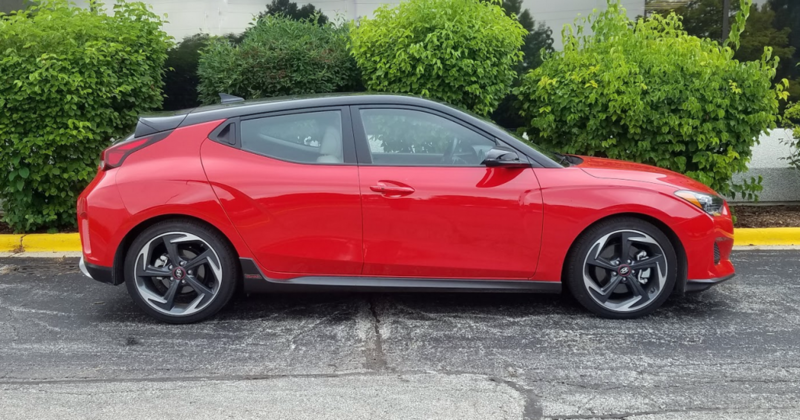 The 2019 model year serves as the launch pad for a new generation of Hyundai’s Veloster 3-door hatchback. Veloster 2.0 is somewhat reconfigured for better passenger room, adds trim levels, and incorporates new features. 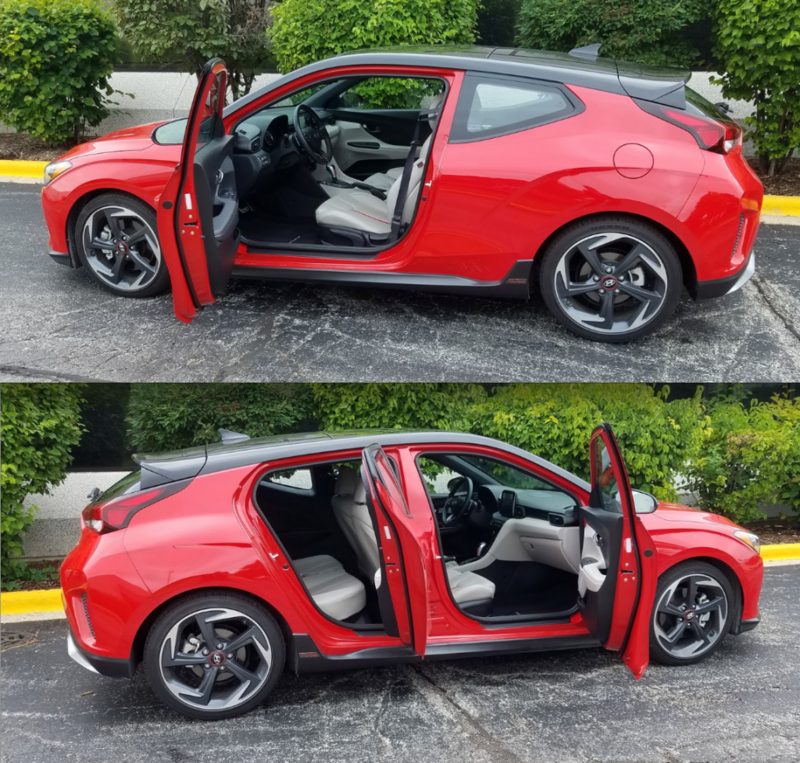 Indeed, “Veloster 2.0” isn’t just a euphemism for improvement in this car because there actually is a 2.0—as in liters of engine displacement—a new base powerplant that makes 147 horsepower. 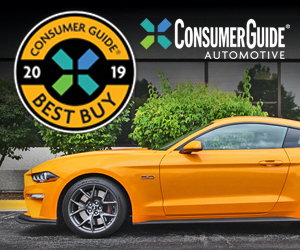 However, Consumer Guide editors drove a Turbo Ultimate with the carryover turbocharged 1.6-liter 4-cylinder that still generates 201 horsepower. The Ultimate is the new “loaded” member of the Turbo branch of the Veloster family. With a 7-speed dual-clutch automated-manual transmission, as in the test car, the starting price with delivery is $29,035. (The same car costs $1500 less with a 6-speed manual gearbox.) A set of optional carpeted floor mats pumped the bottom-line number up to $29,160. 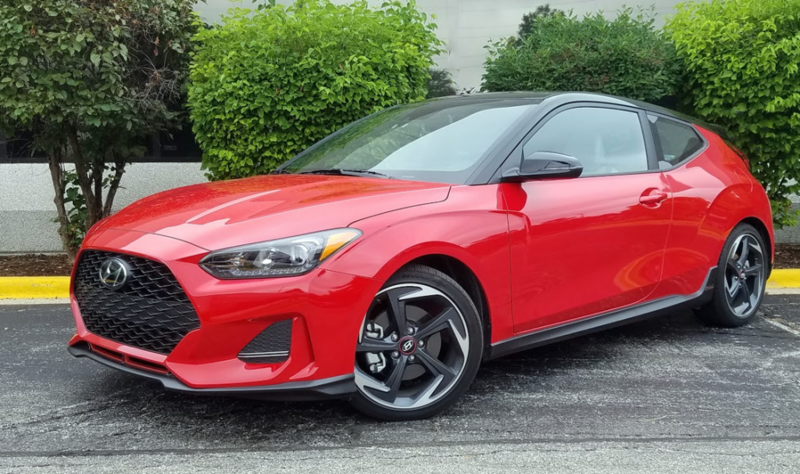 Like the first-generation Veloster, the redesigned 2019 model uses a novel three-door arrangement–one on the driver’s side, and two on the passenger side. Rear-seat headroom and the view out the rear window have both been improved over the first-generation model, but they’re still not great compared to conventional hatchbacks. While the Veloster continues in the mold of a sporty/performance compact—and stands to get really serious about it via an upcoming N version—its most welcome change is increased rear headroom. This 5’-10.5” driver’s head was right up to the canted hatch glass in the first-gen car; in the new one he has at least an inch of space to spare above his noggin. With a fair amount of rear legroom, carrying four adults becomes a realistic scenario and makes this Hyundai hatch a better value. Do note that the triangular rear-quarter window on the left side is smaller and differently shaped than the glass in the right-side rear door, so left-rear passengers can be forgiven for feeling a little claustrophobic. 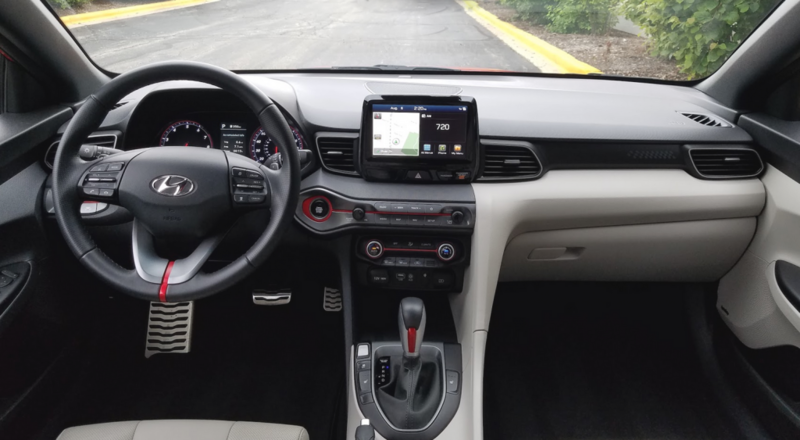 Our Veloster Turbo Ultimate’s interior boasted plenty of sporty touches, including red accents on the dash and seats, metal sport pedals, and a zany asymmetrical black/cream color scheme. To complete the passenger picture, there’s fine headroom and legroom in front. Driver vision is good to the front and sides, but still very limited straight back, even with the changes. There is a wide-angle camera with dynamic guidelines that is a boon to backing up. The Veloster has 19.9 cu. ft. of cargo volume behind the rear seats, and 44.5 with the rear seats folded–that’s good for a sporty car, but most conventional compact sporty hatchbacks (such as the Hyundai’s own Elantra GT) beat it. Rear cargo space is good considering that it’s in such a small car. The load floor is flat, and the sides are shaped to maximize utility. Still, there is a tall lip at the opening, which requires a lot of lift to remove a load. 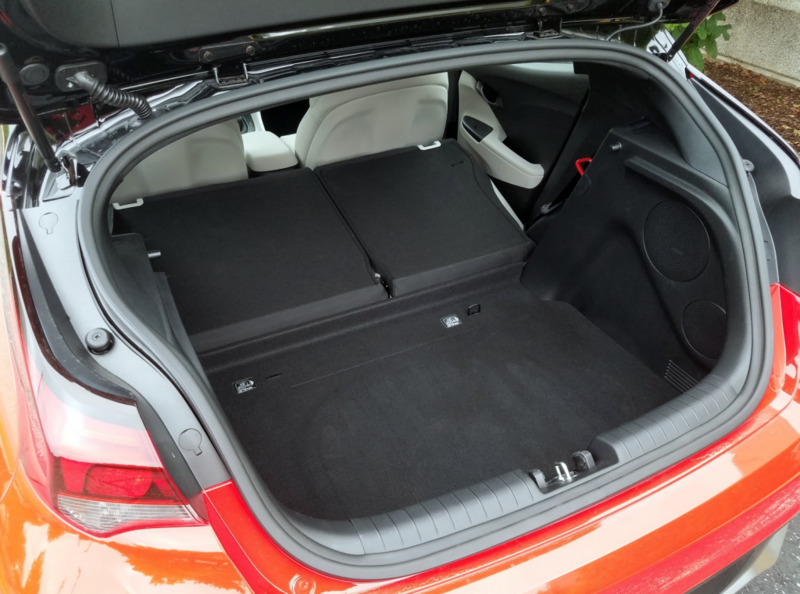 Plus, while the 60/40-split rear seats fold almost flat, they do so a few inches above the level of the trunk floor. If the line-topping Ultimate lives up to its name anywhere, it’s in the list of features it packs into the Veloster. Even at this level the only padded areas in the cabin are on armrests and the console-box lid—everything else on the dash, doors, and console is grained plastic with no underlying give. That said, the test car did have a daring left-side black/right-side cream mix of plastics in these areas. Items that make the Ultimate stand out from the R-Spec and base Turbo models are leather upholstery, a head-up display, navigation, Qi wireless charging, rain-sensing windshield wipers, adaptive cruise control (with the automatic transmission), and the addition of pedestrian detection to the forward-collision warning and mitigation found on all other Velosters. Other equipment includes 18-inch alloy wheels, LED headlights and taillights, automatic high beams, sunroof, heated mirrors, heated front seats, power lumbar adjustment for the driver’s seat, automatic climate control, keyless access and starting, 8-speaker premium audio with satellite radio and an 8-inch display screen, Apple CarPlay/Android Auto compatibility, Hyundai Blue Link telematics, lane-keep assist, driver-attention warning, and blind-spot and rear-cross-traffic alerts. The climate controls have convenient temperature-selection and fan-speed dials, which happily limit reliance on repetitive-push buttons. The audio system’s external tuning knob helped speed up this driver’s hunt for desired radio stations, which were a snap to make into presets on the touchscreen. Cabin storage falls to a decently large glove box; a small, square console box; wireless-charging tray and device-input block at the front of the console; front-door pockets; and two open cup holders in the console. Rear-seat conveniences are limited to open cup holders and small tray between the seats. 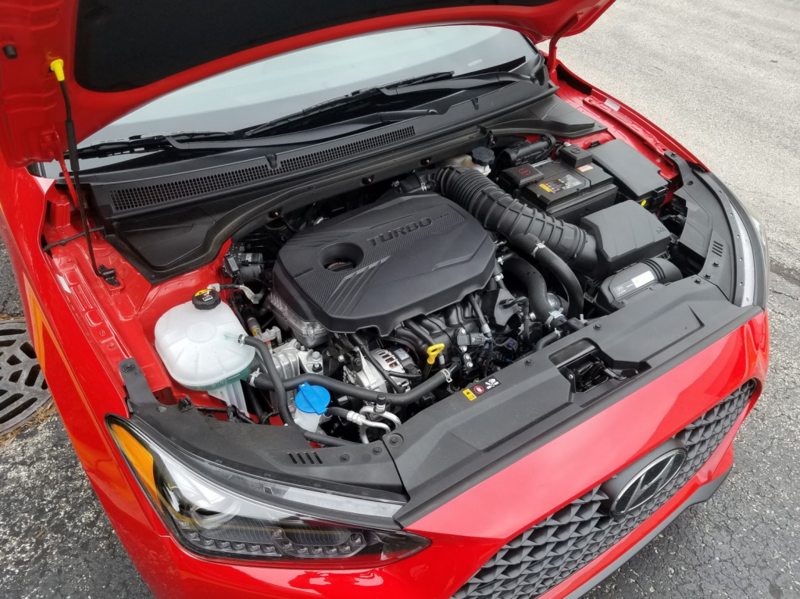 The Veloster Turbo’s spunky turbocharged 1.6-liter 4-cylinder puts out 201 horsepower, but it’s not the hottest engine in the Veloster line–the high-performance Veloster N has a 275-hp turbo 2.0-liter four. Taking all of this out for a spin reveals a car with pretty good power and minimal turbo lag. That said, in “Sport” mode the automated manual wasn’t a lot of fun while noodling along in traffic—and 44 percent of this reviewer’s test drive came under city-type conditions. The drawn-out process of practically every shift was perceptible, and it shifted at some inopportune times. 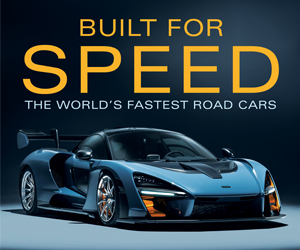 Even cruising along on the highway there were instances at various shift points—around 60 mph, for example—where the thing rather forcibly changed gears with every slight fluctuation of accelerator-pedal pressure. The lesson here seems to be go fast—calls for real speed in Sport mode came with tidier shifts—or go home, preferably in “Comfort” mode where shifts are smoother. The Turbo with the automated manual has EPA fuel-economy ratings of 28 mpg in the city, 34 mpg on the highway, and 30 combined. This driver’s highway-biased stint of 171.8 miles averaged out to a solid 31.55 mpg. In other ways, the Veloster proved itself fairly fun to drive. It handled well, and stopped quickly. However, it was not immune from going into a little hop in back when hitting pavement cuts and cracks that we had no problem finding in the heart of roadwork season. We’re sure that wasn’t the kind of launch Hyundai had in mind for the redesigned ’19 Veloster. The redesigned Veloster’s unique 3-door body, exuberant styling inside and out, and respectable fuel economy should win it a good number of sporty-compact buyers. The Turbo offers sprightly acceleration, but its overall suspension composure trails that of rivals such as the Volkswagen Golf GTI and Honda Civic Si. Written by: The Daily Drive staff on September 21, 2018.